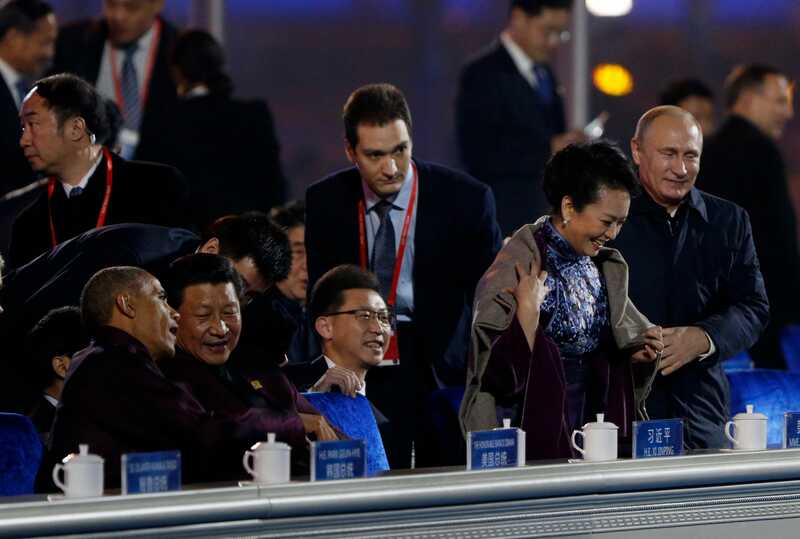 REUTERS/StringerRussia’s President Vladimir Putin (R) helps put a blanket on Peng Liyuan (2nd R), wife of China’s President Xi Jinping (2nd L), as Xi talks to U.S. President Barack Obama (L) during a lights and fireworks show to celebrate Asia-Pacific Economic Cooperation (APEC) Leaders’ Meeting, at National Aquatics Center, or Water Cube, in Beijing, November 10, 2014. The US and others have charged Russia over the past few days with violating certain elements of a ceasefire agreement reached in September. Ukrainian President Petro Poroshenko told US Vice President Joe Biden on Monday that Russia had transferred additional heavy weapons to pro-Russian separatists in the country’s eastern region, while there has been increased shelling of Ukrainian government positions over the past few days. Yuriy Sergeyev, Ukraine’s ambassador to the United Nations, said Tuesday that Russia has “doubled” the supplies of weaponry to pro-Russian separatists in Ukraine’s eastern region and has amassed a “big number” of troops close to the border. Meanwhile, the Organisation for Security and Co-Operation in Europe said another large, unmarked convoy moved into eastern Ukraine. The convoy, the OSCE said, was made up of 43 green military trucks, including five with the artillery pieces known as howitzers and five with multiple rocket-launch systems. With DNR & jounalists on the road from Donetsk to #MH17 we observe appr. 25 army vehicles with artillery, GRAD launchers heading west. 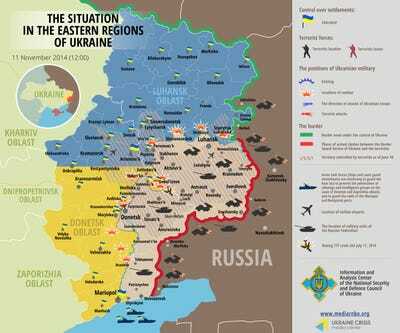 Fighting in the country’s eastern regions has intensified in recent days. Reuters reports heavy shelling near the rebel-held city of Donetsk on Tuesday, while pro-Ukrainian news reports also indicated Ukrainian forces came under fire near Zamozhne, which is close to the strategic city of Mariupol. Ukraine’s National Security and Defence Council says there was also heavy activity near Donetsk, Debaltseve, Luhansk, and Berezove. 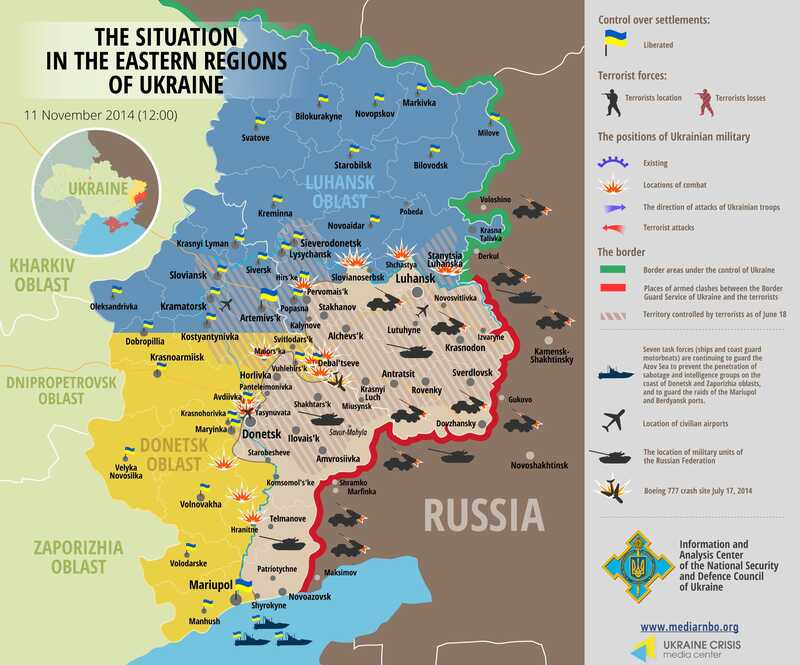 Ukrainian National Security and Defence CouncilThe situation in eastern Ukraine as of Nov. 11. The escalation takes place amid the backdrop of the Asia-Pacific Economic Cooperation (APEC) forum in Beijing, where Putin is meeting with other top world leaders, including President Barack Obama. The two leaders met three times informally over the past day, and the White House said they spoke about Ukraine, along with the crisis in Syria and the Iran nuclear negotiations. 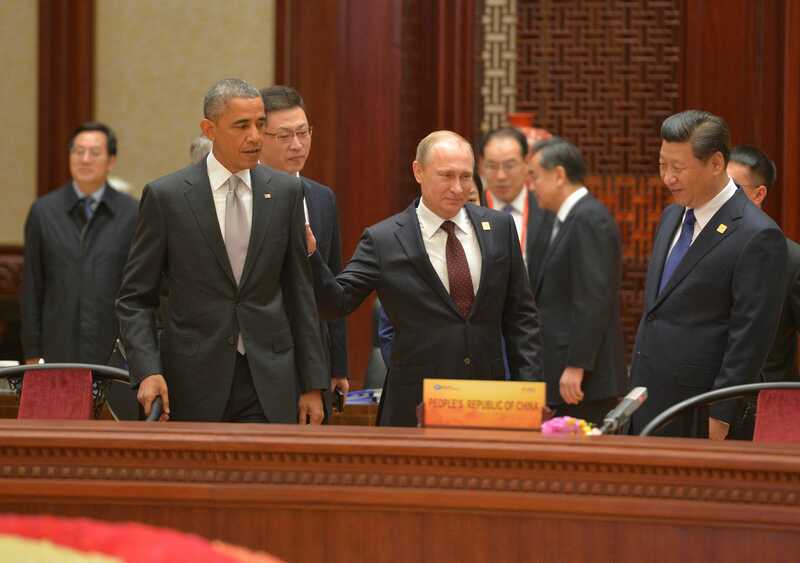 REUTERS/Alexei Druzhinin/RIA Novosti/KremlinU.S. President Barack Obama, Russian President Vladimir Putin and Chinese President Xi Jinping attend a plenary session during the Asia Pacific Economic Cooperation (APEC) Summit in Beijing, November 11, 2014. Biden, in a phone conversation with Poroshenko on Monday, said the US was prepared to escalate “costs” on Russia if it continues to escalate the situation. The White House also warned Russia on Monday of the consequences of further escalation. “We are very concerned by intensified fighting in eastern Ukraine, as well as numerous reports, including from the Special Monitoring Mission of the Organisation for Security and Cooperation in Europe (OSCE), that Russian backed and supplied separatists are moving large convoys of heavy weapons and tanks to the front lines of the conflict,” said Bernadette Meehan, a spokeswoman for the White House’s National Security Council.